I want the plugin which do same thing as xVotemap on round end. I googled it and found "Insane-Limits-Admin-Votemap-set-next-map-on-round-end-(working-code)"
Could someone make it with IL or proconrulz? Just setup for short time for vote. tomopcver are you still interested? the timespan between round end and next round are very short. votemap within 50 seconds. many players are writing in this few seconds chat stuff like "gg, bye, easy". are you sure, you realy want it? In battlefield3 we can't type any chat while the timespan between round end and next round but possible in bf4. As you say, votemap within 50 seconds is difficult but I think its not impossible. of course your main player base will lern this kind of votemap after few rounds. but the question is whether it makes sense to write/use this script. it is a little bit strange for new player because usually the votemap runs during the round. it is a little bit strange for new player because usually the votemap runs during the round. My server usually has same players and only a few new ones, So it's ok to me. this script is a special votemap on round end. 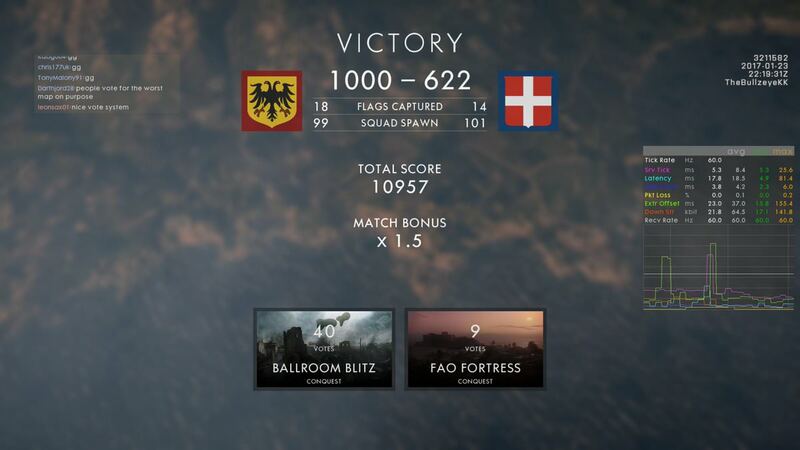 on round end when the score board is showing, it starts the votmap in the in-game-chat. all players can vote the next map. after few secounds (ca. 30 sec) the voting will be end. the most voted map will be the next map. Last edited by tomopcver; 27-05-2018 at 14:51.